Wood siding where the paint has cracked and water has intruded (poor maintenance). Mild to severe unexplained illness, see symptoms, in combination with any other building problems listed on this page. Swollen, crumbling walls or buckling floor boards. Sewer backup which has caused water harm. Washing machine overflow, washing machine leaks such as drain valve phalanges, leaky gaskets, etc. Leaky toilet seal or bathtub drainage problems. Disaster damage (hurricane, flood, earthquake, monsoon, lightening, etc.). 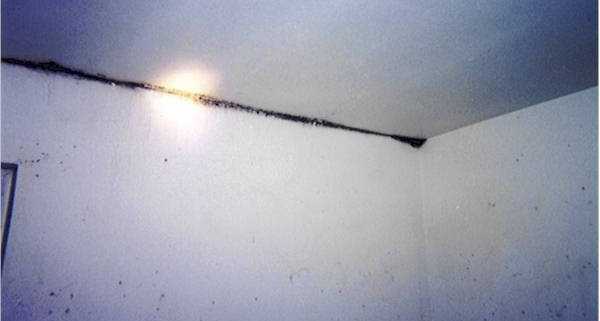 Water damage after a fire. 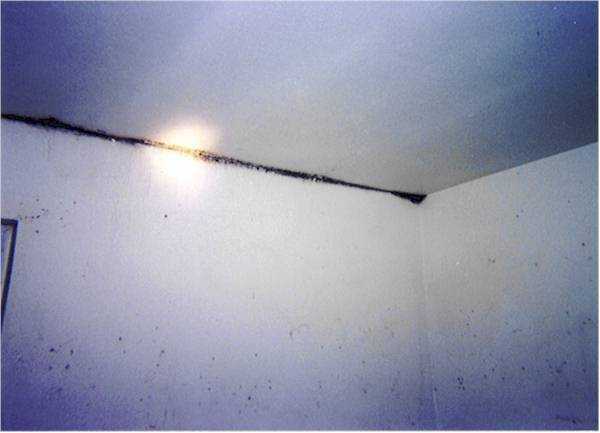 (Unfortunately, many restoration companies fail to address or prevent mold while they control water/fire restoration). Faulty air conditioning or heating system. Vinyl siding that is defective or installed in a incorrect manner, such as trim pieces missing or bowing, or not installed properly around windows or has holes from branches or improper care. Clogged vents or air ducts. Cracked or disconnected hoses behind refrigerators from automatic ice makers/water dispensers or dishwashers. Construction defects that could lead to water intrusion (i.e., windows not seated properly, soffits with pieces missing or installed in the wrong direction, cracked foundations, shoddy workmanship). Poor planning (i.e., lack of crawl space, sealed windows, no overflow spouts in sinks/bathtubs, carpeting in bathrooms. Downspouts that are disconnected, allowing water to flow under the foundation or along the siding. Cut-rate materials; substandard plumbing, shoddy siding, etc. Flat roofs that are not properly maintained (annually checked for drainage, bubbles, holes and coating). Location; flood zones, water table, environmental issues, etc. Improperly installed or maintained basements. Poor carpet cleaning jobs where excess water was not removed properly. Note: Carpet absorbs mold, bacteria, dust mites, cockroach mix, chemicals, and many other toxins. It should be avoided if at all possible. Throw rugs and natural or even synthetic flooring is a much healthier alternative. Many industrialized nations who recognize the hazards of mold have banned wall to wall carpeting in new home construction due to health concerns. *Despite construction problems, some recent mold concerns can be attributed to overall problems resulting from the greenhouse affect. This is not an all inclusive list, nor does it suggest you may possibly have a mold problem. For more information, seek the advice of a professional.